The name ZEBON is a corruption of the French/Norman word SEPEN meaning pine. 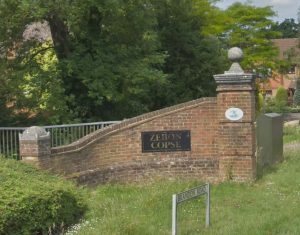 ZEBON COPSE Itself lies on the north side of the estate towards the canal whilst beyond the canal lies an area of land known as ZEPHON COMMON — another corruption of the original word. The original land that the estate Is built on used to be celled VELMEAD FARM. The farm itself was part of the much larger REDFIELDS ESTATE. The centrepiece of the Redfields Estate was REDFIELDS HOUSE, which Is now a training establishment for accountants. 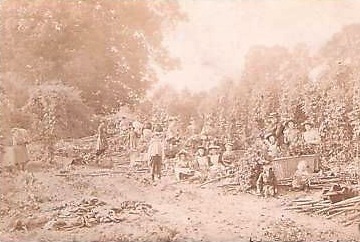 The BRANDON family, who owned the estate, mainly grew tobacco and hops. 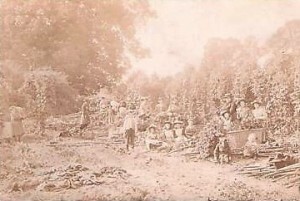 The hot-curing sheds, where they processed the tobacco, were situated where the Redfields Industrial Estate stands now. 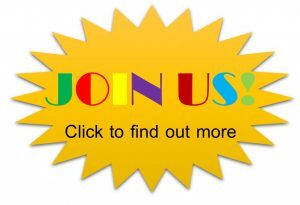 The estate was not split up until after the second world war when Mr Brandon died. To explain the meaning behind the road names on the estate, these were chosen by Stan Knight who lives in Crookham village and whose family has lived in the area for many years. Stan serves on our parish council and Is very knowledgeable about local history and it is really him I need to thank for writing this piece. Brandon Road was named after the original owner of the estate whilst Blue Prior Court was named after the brand of cigarettes produced from Crookham tobacco by the firm of Stephens at Salisbury. Nicotiana Court Is named after the Latin name for the tobacco plant. Du Maurier, Frenchmans Creak, Daphne Drive, Danvers Drive and Rebecca Close are named In memory of the famous author Daphne Du Maurier who lived for a while in a house called Greyfriars which stood In nearby Gables Road and It was here that she wrote Frenchmans Creek. Browning Road and Browning Close are named after her husband, General Browning. Barn Meadow Close, Nether Vell Mead, Further Veil Mead, Sepen Mead and Twissel Thorne are all original field names taken from a map of the area dated 1840. Annettes Croft and Hunnels Close are taken from the Crondall Customary dated 1567. This was a document drawn up after the Dissolution of the Monasteries Act . A court was held at which everyone who had land had to prove ownership. There are still names from this document to appear on the estate. Hop Garden Is named after the earlier hop growing activities and If you look at the fenced off land by the apartments in Frenchmans Creek you can sill see hops growing there. Finally Constantius Court Is named after the find by a village girl of a fine coin of that Roman Emperor not too far from the development area. Constantius I ruled 293-306 AD and died at York. An account of the history of Fleet and Crookham is HERE.